Are you combining your spouse’s children with yours this Thanksgiving? His/Her, mine and ours is not always a recipe for blissful success. Instead, there is a good chance that underlying emotional currents will make this Thanksgiving meal memorable for all the wrong reasons. Celebrating a grace-filled Thanksgiving takes a lot of effort on your part — but it is well worth it. The University of Houston reveals sobering and enlightening step-parenting statistics. Figures show that 50 percent of youngsters are currently raised in blended families. This dynamic is quickly eclipsing all other types of family setups. A somewhat surprising statistic points out that over 50% of second/third marriages that end in divorce are caused by the children. It is clear that children have a lot of influence on family dynamics. Holidays — including Thanksgiving — are prime time for stress and strife. There are feelings of betrayed loyalty and the fear of betraying a biological parent’s allegiance. There are new family members to get to know and adapt to. Competition between half siblings is common. Thanksgiving traditions vary. Holiday customs are different and beloved tasks may go by the wayside in a new family. You new wife may have promised to love, honor and obey; your new husband may have sworn to cleave unto you until death do us part, but your step children have taken no such vows. They are simply along for the ride. Do not expect them to live up to your vows — after all, they were left holding the bag the first time around. If your spouse is a serial-marriage partner, there is even less of a chance that the children might willingly give their hearts. So What’s the Step Parent To Do At Thanksgiving? What tools does a step parent need? Practice applied Christianity. Treat the stepchildren the way you want to be treated. If you want respect, treat the children — regardless of age — with respect. Christ’s Golden Rule is clear: Model the desired behavior. Of course, note that Jesus did not specify an amount of time for another person to reciprocate; in fact, he left the reciprocation blank. Instead, Christ intended for you to be exemplary — no matter what. Be comfortable in your role. You will never be a new mom or dad. The kids already have one. Do not demand to be called mom or dad; do not refer to the bio-parent as real mom or other mom. A step parent has a different rank in the familial hierarchy than a parent; do not try to aspire to a seat of honor that is not yours to occupy. Instead, flesh out your role of step parent as a positive influence on — and provider of care to — the children. Become unified with your spouse. Present the kids with a united front when it comes to acceptable and unacceptable behaviors, consequences and expectations. Start new traditions. Do not try to compete with the bio-parent at Thanksgiving. Whether you are in a custodial or non-custodial position, remember that the old traditions mean a lot to the kids. Start your own, so as to differentiate your home from the other parent’s residence. There is no need to one-up the mom or dad. Respect the other parent. Go out of your way to defer to the other parent. Children will feel more comfortable with you, if they realize that liking you will not in any way jeopardize their loyalty to their mom or dad. Do not expect Rockwell. You knew ahead of time that you were entering into a blended family situation. Do not (now) bemoan the unfairness of having to hold up your plans and dreams to accommodate a court-ordered visitation schedule. 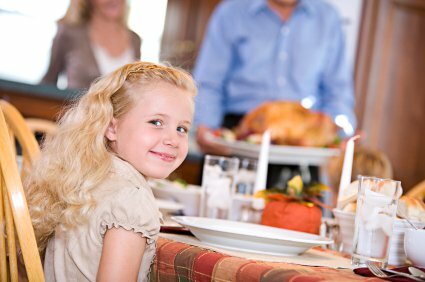 Do not rebel when the children fail to sit at the table with bright eyes that gaze adoringly at you as you present the turkey. This is rarely the case for nuclear families and is made more difficult for blended families, where intense likes and dislikes create an emotional undertow. With God’s grace, it is possible to make it through the holiday season in general and Thanksgiving in particular. Just remember: God’s grace was meant to be shared and freely given away — not demanded for oneself and then hidden from prying eyes. What happened to my In-laws?